Charles Henry Albrecht was born on October 22, 1891 in Charleston, South Carolina. His father, John Henry Albrecht, was born in 1856 in SC. His mother, Mary Albrecht, was born in 1858 in SC. His parents married in 1878 and had seven children, George (b.1879), Will (b.1881), Edgar (b.1883), Emily (b.1885), Charles (b.1891), Harry (b.1892), and Josephine (b.1896). The family lived at 416 Forsyth Street in Jacksonville, Florida, where the father worked as a hotel steward. In 1900 the three oldest brothers were all employed as salesmen at a local dry goods store. In 1904, at the age of thirteen, Charles Henry Albrecht completed the eighth grade and entered the work force. He was a newsboy at the Jacksonville Times Union newspaper, located at the intersection of Adam Street and Cedar Street. On August 1, 1908 his father, John Henry Albrecht, died at the age of fifty-two in Jacksonville, FL. After this tragic death, the widowed mother and her seven children supported themselves. By 1910 Charles Henry Albrecht, age nineteen, sold newspaper advertising as a Commercial Traveler. He lived at home with his widowed mother, unmarried sisters and several married brothers. In 1913 he was a clerk in the advertising department at the Jacksonville Times Union. He left home and moved to his own apartment at 419 East Second Street in Jacksonville, FL. In 1916 he was promoted to Assistant Circulation Manager at the newspaper. On June 5, 1917, during the Great War, he was drafted by the Army. He was honorably discharged in November of 1918. After the war he moved to New York City to seek his fortune in advertising at The Brooklyn Citizen newspaper. In 1919 he married Josephine Collins. She was born in Iowa in 1889, so the bride was two years older than the groom. On November 13, 1920 their son, Kenneth Albrecht, was born in New York City. In 1923 he was hired as director of advertising at The New York Herald newspaper. In 1930 he lived as a lodger with his wife and son at 503 West 111th Street on the Upper West Side of Manhattan, in an apartment that was rented to his wife's aunt, Mary Collins (b.1854 in Iowa), who was a widow of seventy-eight. His occupation was listed as "Newspaper Advertising." In 1940 he lived with his wife and son at 37-20 81st Street in Jackson Heights, Queens, NY. His occupation was listed as "Salesman at a Newspaper." 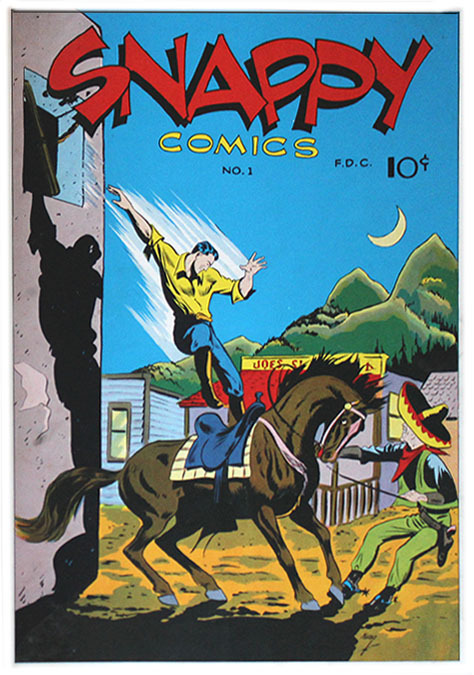 In 1941 C. H. Albrecht became involved with the growing comic book industry, which had roots in the re-packaging of newspaper comic strips. Color Funnies in the Sunday Supplements were typically printed by subcontractors that owned a specially required four-color press. 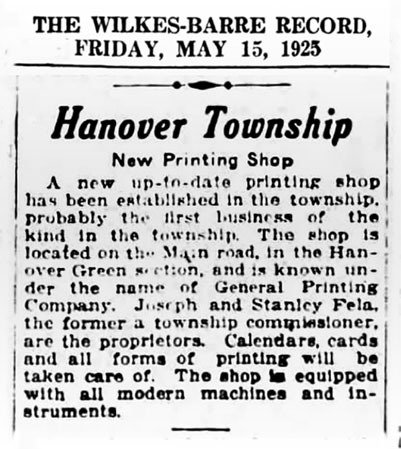 There were comparatively few of these expensive machines, so it was more efficient to operate the four-color press independently, while supplying Sunday Supplement materials to a syndicate of newspapers across several surrounding states. C. H. Albrecht developed a relationship with Central Color Printing in Wilkes-Barre, Pennsylvania, at 221 Coyingham Street. The business was originally founded by Stanley Fela (1907-1957) in 1925 and called General Printing Company, but by WWII it was named Central Color Printing. On May 31, 1945 The New York Times reported two publishers, Lindsey L. Baird and Edward Sayle, were indicted by the Federal Court for use of 600 tons of paper without having obtained a quota, in violation of rationing laws under the War Powers Act. Lindsey L. Baird was convicted and sentenced to prison for sixty days and fined $20,000. He was described by the prosecuting attorney as a "contumacious chiseler." Lindsey L. Baird was president of Rewl Publications, 500 Fifth Avenue. 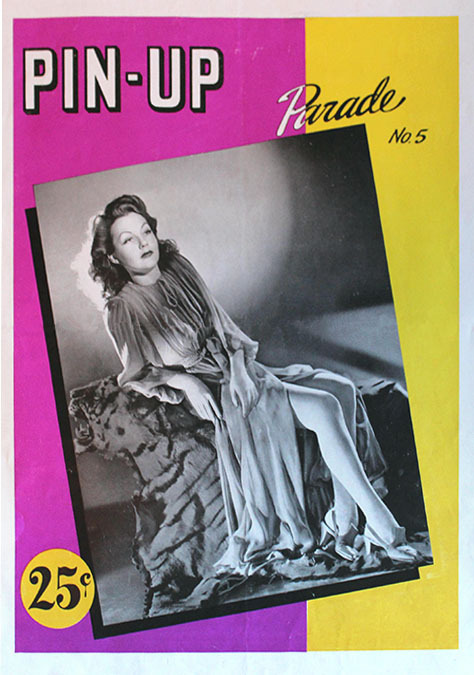 He produced Blazing Comics and The Blue Circle Magazine, which were printed through C. H. Albrecht at Central Color Printing in Wilkes-Barre, PA.
Edward Sayle was listed as president of Arrow Publishers and Bond Publishers, at 16 West 46th Street, which produced Pin-Up Parade. It was printed through C. H. Albrecht at Central Color Printing of Wilkes-Barre. 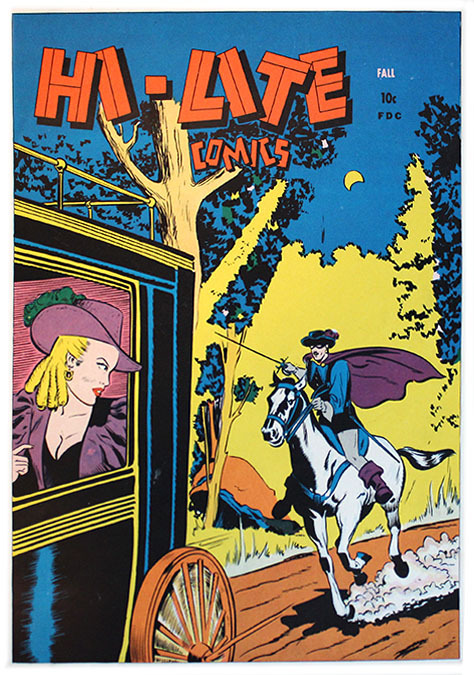 Oddly enough, Edward Sayle was in fact a successful real estate broker, who handled Manhattan properties for twenty years before and after this one curious incident, when his name was listed as the publisher of comic books and pin-up magazines. The publishing name "Arrow" was more commonly associated with Paul Sammpliner. On April 26, 1942, during WWII, C. H. Albrecht registered with the draft board as required by law. He was recorded at the time to be fifty-one, five-six, 174 pounds, bald, pale complexion with blue eyes and a "scar on left arm." He was listed as self employed at 475 Fifth Avenue. 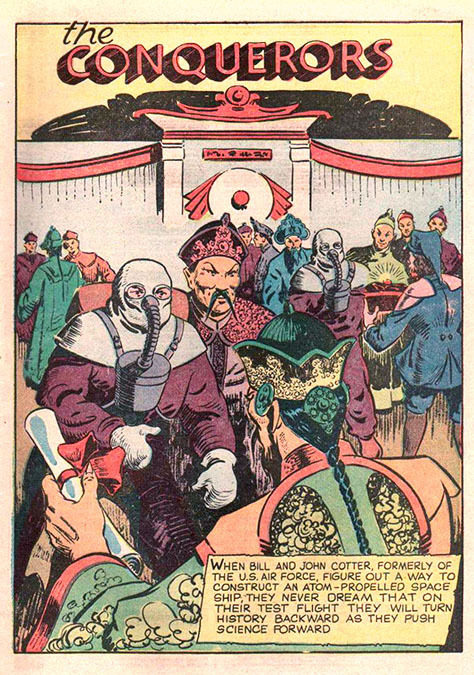 On November 24, 1945 C. H. Albrecht ordered Central Color Printing to make one set of four color electroplates of Occult Comics. 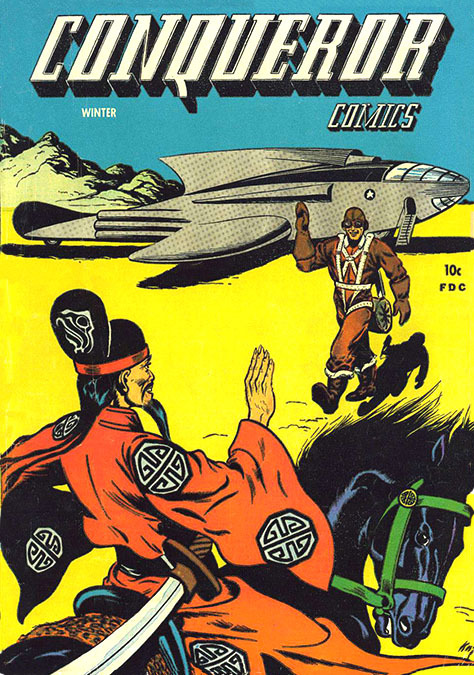 A few days later he wrote to "Mr. Stanley Fela, Third and fourth cover are the same as Warrior Comics. You have them, not necessary to make new electroplates. - C.H.A." 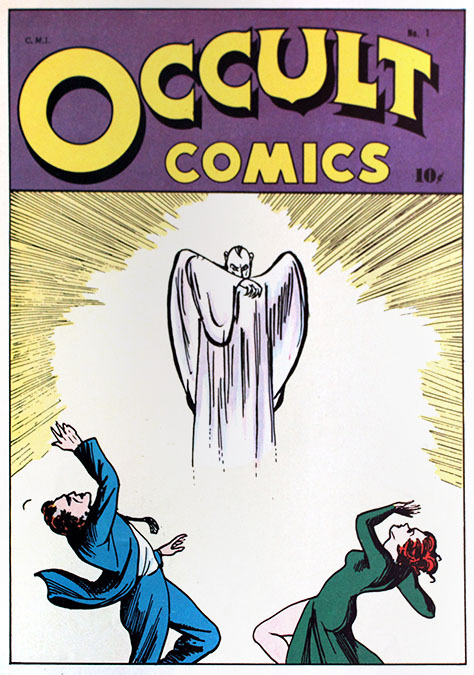 The indicia of the first and only issue of Occult Comics, Winter 1945, listed the publisher as "Nicholson Publishing Company at 45 West 45th Street." 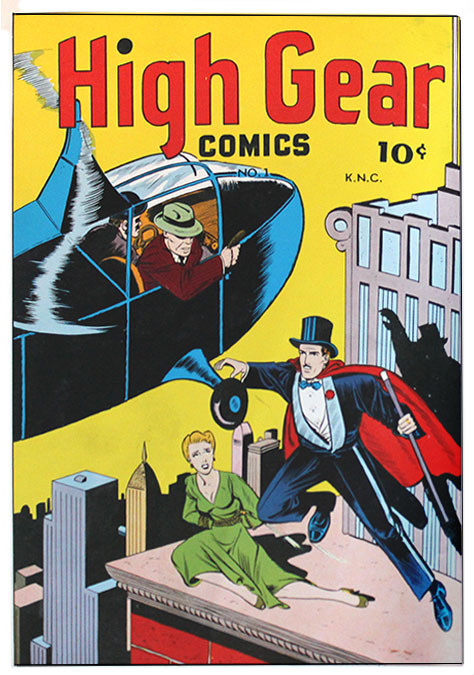 Oddly enough, 45 West 45th Street was also the original address for Paul Sampliner's Eastern Distribution Corporation, which first published Major Malcolm Wheeler Nicholson's New Fun Comics at that same address. Paul Sampliner also owned Man Story Magazines Advertising Agency, located at 45 West 45th Street. Furthermore, the daughter of Sampliner's business partner, Harry Donenfeld, was Sonia Donenfeld, and she was married to Frederick H. Iger, a WWII veteran and student at NYU. Sampliner and Donenfeld appointed the new Son-In-Law "co-owner" of American Comics Group (ACG) at 45 West 45th Street. The other co-owner, Benjamin Sangor (1889-1953), was the Brother-In-Law of Paul Sampliner. Benjamin Sangor's wife, Frances Unger Sangor, was the sister of Sophie Unger Sampliner. 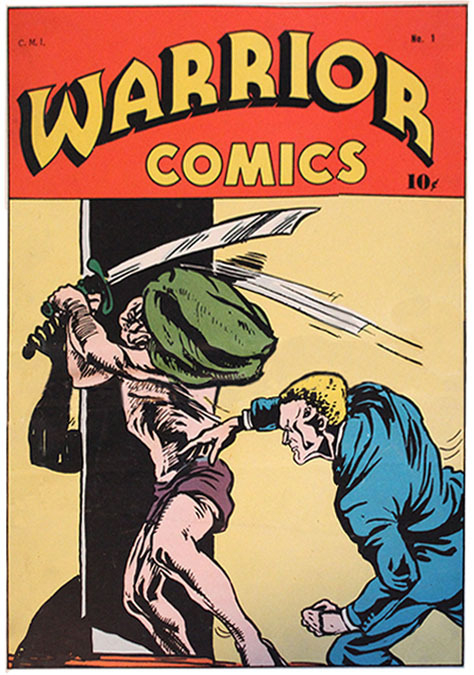 The indicia of the first and only issue of Conqueror Comics, Winter 1945, listed "Albrecht Publishing Company, Editorial and Executive offices at 545 Fifth Ave., NYC." and "Publishing monthly at 221 Coyingham Street, Wilkes-Barre, PA."
The address 545 Fifth Avenue was also used by the St. John Publishing Company, which was owned by Archer St. John. The address 221 Coyingham Street, Wilkes-Barre, PA, was the address of Central Color Printing. 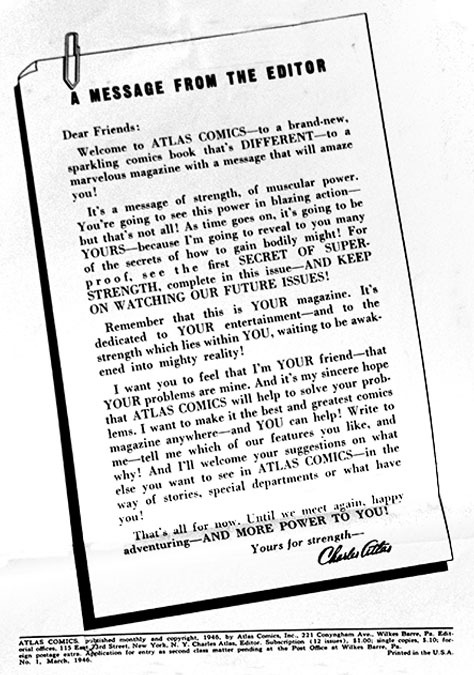 C. H. Albrecht contracted these comic book printing jobs with Central Color Printing of Wilkes-Barre, PA. By that time Stanley Fela had formed a newly incorporated business called Central Color Press, which was officially owned by Victor S. Fox, although the actual printing company at 221 Coyingham Street in Wilkes-Barre, PA, was still owned and operated by Stanley Fela. 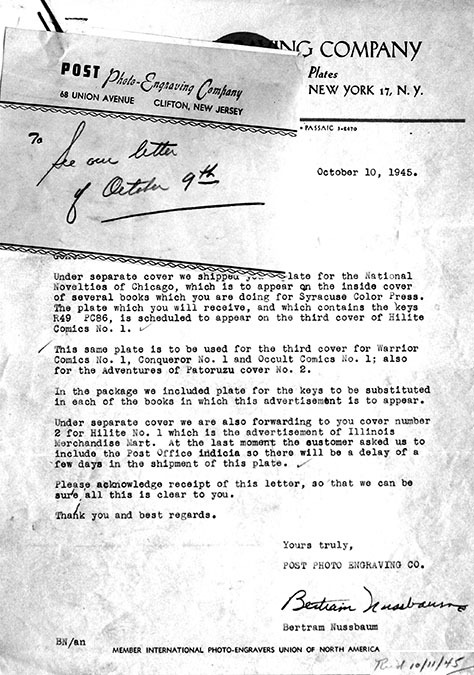 Correspondence dated October 9,10,and 11, 1945 between the Post Photo-Engraving Company of Clifton, New Jersey, and Central Color Printing document the production of a Black & White plate for an advertisement for National Novelties at 608 South Dearborn Street in Chicago, IL, which was to appear on the inside cover of several comic books that Central Color Printing was doing for Syracuse Color Press. 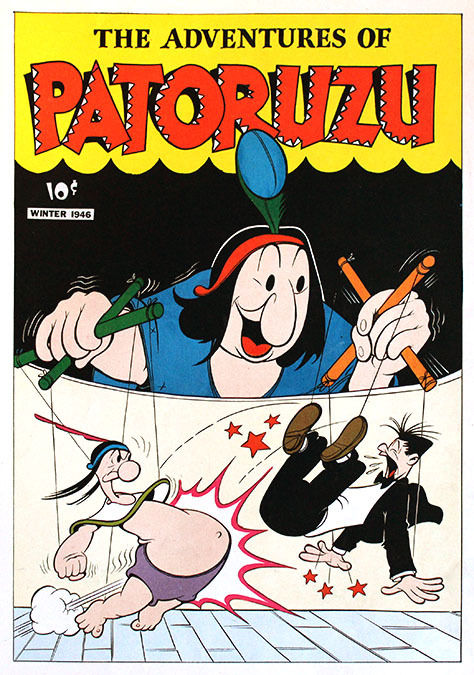 The plate was scheduled to appear on the inside covers of Hi-Lite Comics #1, Warrior Comics #1, Conqueror Comics #1, Occult Comics #1, and The Adventures of Patoruzu #1 (a Spanish language comic book by Dante Quinterno). 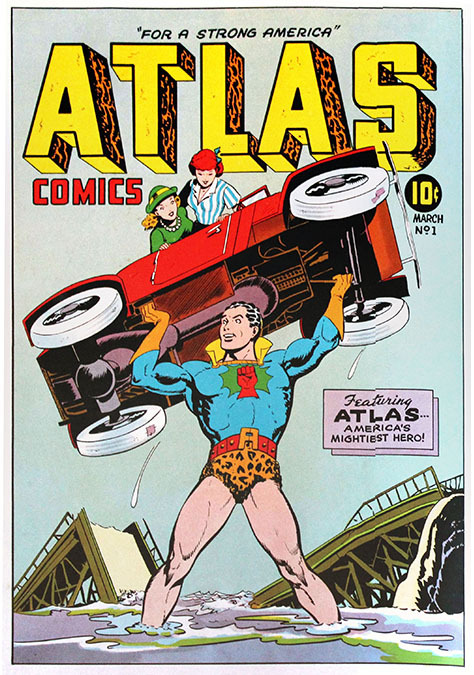 On November 20, 1945 C. H. Albrecht organized the production of Atlas Comics, as an advertising vehicle for Charles Atlas, the famous mail-order fitness expert. 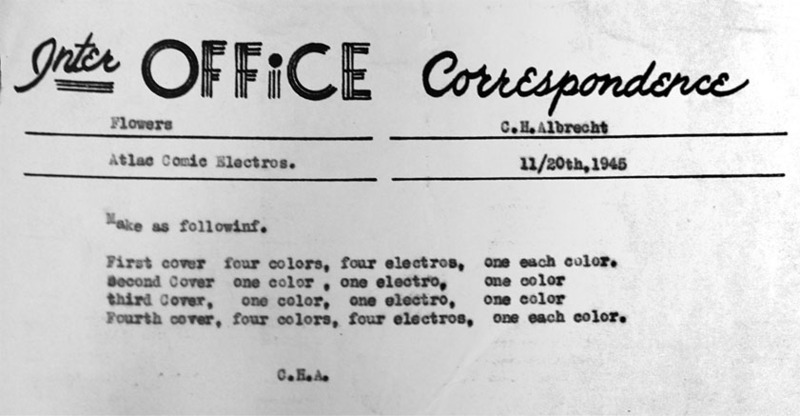 On October 3, 1947 Central Color Printing Company of 221 Coyingham Street in Wilkes-Barre, PA, legally changed its name to Central Color Press Incorporated. On October 24, 1947 The New York Times reported the Potsdam Paper Mills of Potsdam, NY, were sold to Victor S. Fox, NYC comic book publisher, and president of Fox Feature Syndicate. The plant manufactured newsprint and cover stock out of reclaimed waste from Central Color Press. The 1948 NYC Telephone Directory listed the "Printing" business of Charles H. Albrecht at 545 Fifth Avenue in NYC. The same listing remained in all subsequent NYC directories for the next nine years. On July 15, 1950 The New York Times reported the bankruptcy proceedings of Fox Feature Syndicate, 60 East 42nd Street, NYC, Victor S. Fox, president. Additionally, Central Color Press, 60 East 42nd Street, including a plant located at Wilkes-Barre, PA, also entered bankruptcy proceedings. Legal documents listed Victor S. Fox as president, and identified the company as a wholly owned subsidiary of Fox Feature Syndicate. On September 7, 1951 the wife of C. H. Albrecht, Josephine Collins Albrecht, died at the age of fifty-three in NYC. In 1957 he married his second wife, Thelma Blanche Shappell. She was born November 25, 1900 in Georgia. 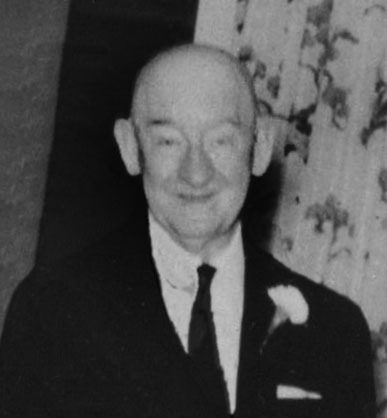 On July 6, 1957 Victor S. Fox died at the age sixty-four in Greenwich, Connecticut. On July 30, 1957 the Buffalo Courier-Express reported, "Bankruptcy Plan Offered To Continue Publication at Everybody's Daily Publishing Company of Buffalo. Claim against the company filed by Charles H. Albrecht of NYC for $997,624 would be disallowed." 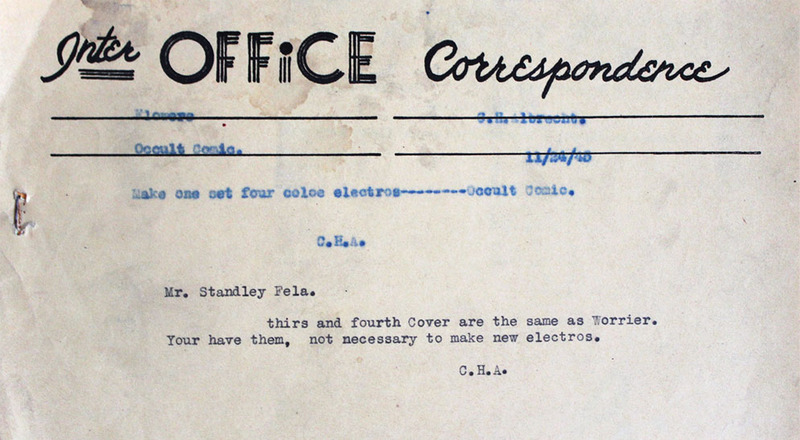 On December 1, 1957 Stanley Fela, the printer and original owner of Central Color Press, died at the age of fifty. 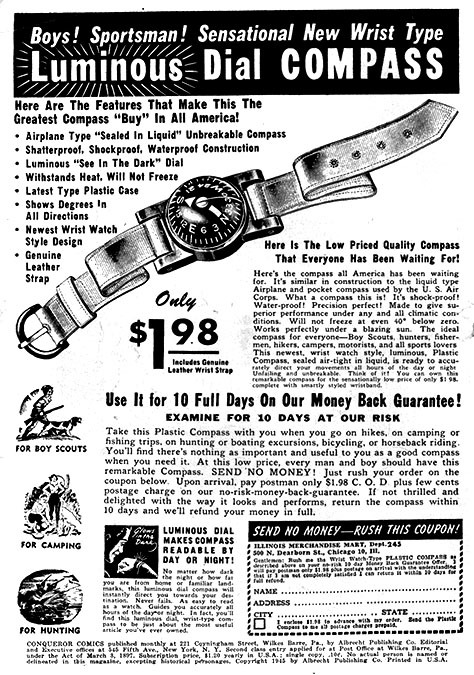 On May 14, 1958 the Buffalo Courier-Express reported, "Hearing Date Set for Bankruptcy Claims. The Court set June 16 for a hearing on $997,624 in disputed claims against the bankrupt Everybody's Daily Publishing Company. Charles H. Albrecht of Jackson Heights, claims the amount is owed him for commissions and expenses as a sales representative of the local company. The opposition maintains Albrecht has been paid for all commissions and expenses, and is not responsible for the alleged breach of contract." On June 16, 1958 C. H. Albrecht failed to appear in Bankruptcy Court. On September 9, 1958 the Buffalo Courier-Express reported,"Albrecht Claim Ruling Deferred. Charles H. Albrecht, a former sales and job representative for the bankrupt Everybody's Daily Publishing Company, claims he is owed commissions and expenses and damages for breach of contract, amounting to $997,624. His claim will be dismissed on the grounds he failed to appear and prove validity. He claims to have been ill, but the court ordered him to produce a doctor's certificate to prove that illness kept him from appearing at proceedings in Bankruptcy Court." 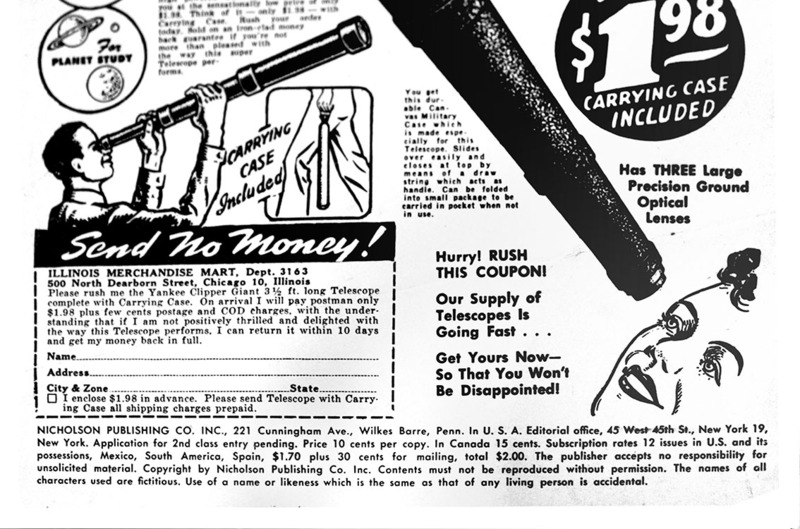 1958 was the last year his "printing" business was listed in NYC directories. In 1959 he retired from business and moved with his wife to Atlanta, GA.
C. H. Albrecht died in Atlanta, GA, at the age of eighty-five on May 16, 1977.